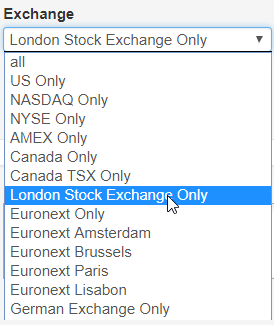 My name is Kristoff, co-founder and co-owner of the stockscreener ChartMill. In this article I would like to share my vision about the past year and give you a glimpse of my expectations and personal trading approach in 2019. As an introduction, my personal trading strategy is mostly based on technical analysis. I like to keep things simple and efficient and I am a big fan of TA mainly because of its simplicity. I strongly believe that almost all important information is included in the price. And that’s why the evolution of price is an important tool for selecting trading setups. Unfortunately, there are also many misunderstandings about the use of technical analysis. The biggest one is that TA would be able to predict price movements. If the price of a company could be predicted with certainty, there would simply never be a market for it. The real power of technical analysis lies in identifying setups on price levels that many investors are looking forward to. With sound money- and risk management this creates opportunities where you can enter the market with relatively little risk. The search for the right setups is also the reason why we initially developed the ChartMill stockscreener. Randomly and manually viewing all charts turned out to be not only very labour-intensive but also ineffective. Too many qualitative setups passed our nose and were spotted too late… ChartMill allows me to scan entire markets and closely monitor the selected shares in no time. 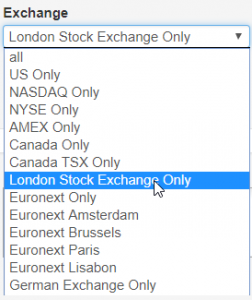 In this article I use the charts of the main US index ETFs, these are not instruments in which I invest directly, I prefer individual shares. But I do use the ETFs to have a general idea of the current market trend. It is my blueprint that determines two things, the choice between long and short and the choice between cash or shares. Let’s start with the beginning, 2018 was a very bad year for many investors. Personally, I only had a handful of positions in the first half of the year, more losers than winners but in the end I was able to close the year breakeven. I felt pretty soon that I was trading against the market and therefore switched to cash fairly quickly. Looking back, there were several short opportunities from October 2018 but I simply didn’t dare to go short. At the end of January we already witnessed our first big dive down. To illustrate this, below are the daily charts of the Index ETFs for Russel 2000, Nasdaq, S&P500 and the Dow Jones Industrial Average. It is quite logical that prices recovered at these levels. 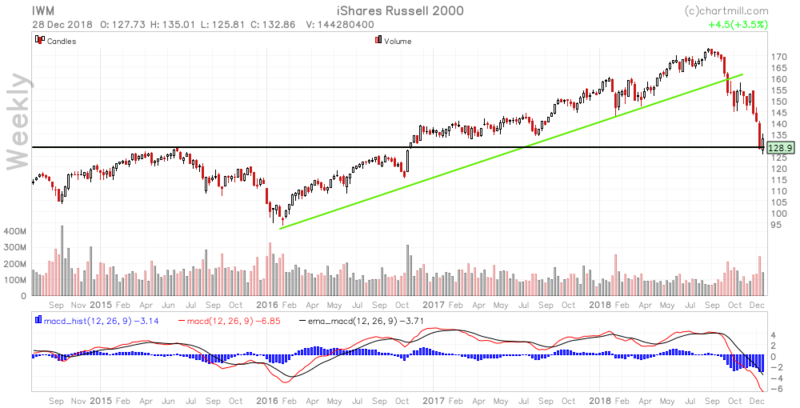 If we zoom out on the weekly chart, we see how buyers came back into the market when the falling prices reached the first significant support levels of 2017. Also noteworthy, the recovery took place with higher volume than the previous decline (see blue circles in the charts below). The price of the QQQ itself had its highest annual price so far in mid-March 2018. By the way, it was this initially strong recovery of the markets that prevented me from going short later, as a result of which I certainly missed some nice profitable shortpositions. This first recovery was followed by a new fall in all indices. For the Dow Jones (chart below) but also for the other index ETFs, this new decline resulted in the formation of a (more or less) double bottom. This double price bottom was the starting point for the indices to begin a new steady climb. 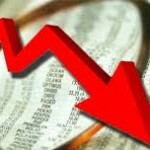 For a moment it seemed that we had gone for a new successful stock market year. It was notable that the increase from April onwards was accompanied by moderate to even low volume. This and the sometimes sharp decreases in the rising trend were the first signs that the uptrend was losing momentum. This was also the period that my stoplosses from the open long positions were hit one by one. I lost my confidence in the market and it seemed better to stand aside and wait for more clarity. 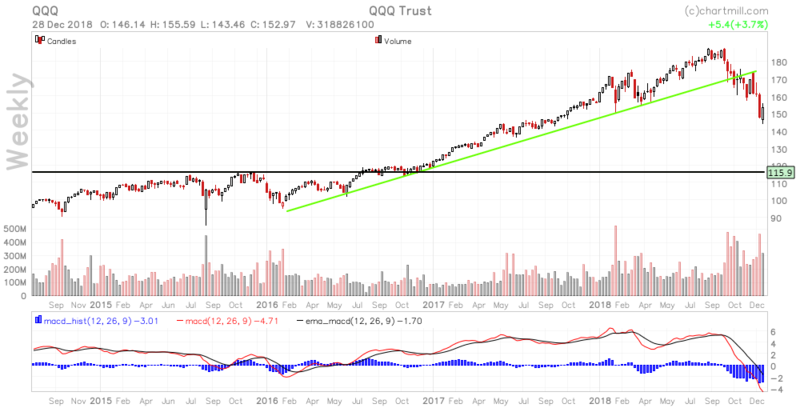 As an example below the chart of the QQQ index-ETF. It is clear to see that the price drops in the upward trend always went hand in hand with higher selling volumes than the buying volumes during the price increases before or after. The market did not show its true face until the beginning of October 2018, with the first wave of sales under heavy increased volume. The market was able to recover slightly and consolidated until the beginning of December, but also during this period it was noticeable that the buyers were in the minority compared to the sellers. When everyone was hoping for an year-end rally the opposite happened, a second even more intense selloff presented itself, which caused the prices to drop dramatically. At the time when prices were recovering after the first selling wave – and bearing in mind the low buying volumes previously observed at the earlier uptrend until the end of september – I considered several short positions. As I already wrote above, this did not happen in the end. The steady climb of the indices over the past years certainly played a role in this. The period was not ideal either. At the time of that first sell wave it was already october and I also took into account the possibility of an Year End rally. So I thought it was too short a time frame to go short. Let’s start by looking at the weekly charts and get a long-term view. So every candle in the chart below represents a full trading week. 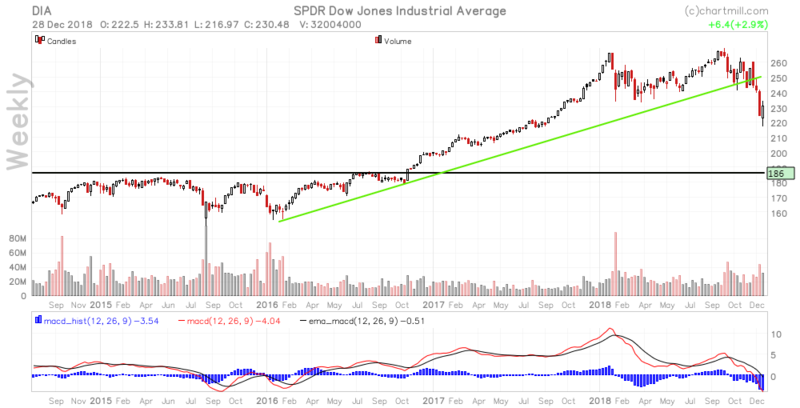 The green ascending line reflects the upward trend that is already running from 2015. The first drop in october caused this line to be broken down. 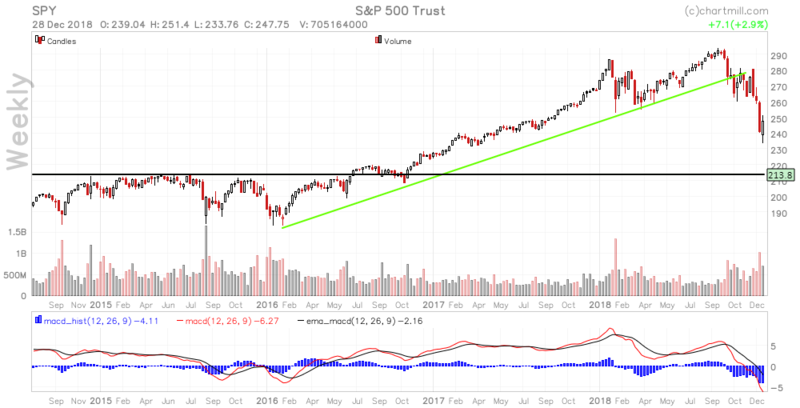 Buyers did their very best to bring the price back within the trend zone but collided with one of the basic principles of technical analysis. Support that is broken down afterwards often acts as resistance. The charts above can be used perfectly in a beginner’s manual about technical analysis. The black horizontal line is the next meaningful horizontal baseline that can be considered as support for the long term. 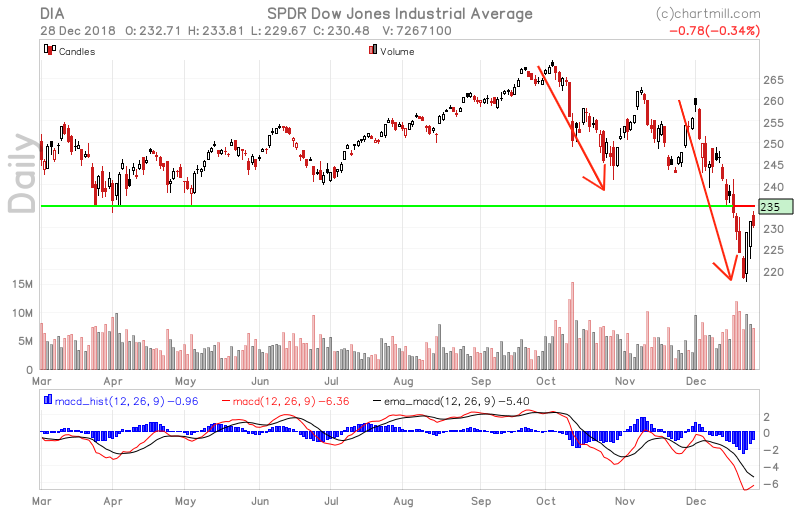 This immediately shows that as far as the DIA, SPY and QQQ are concerned, there is still some room further down. Finally, I also plotted the MACD indicator below the price. Due to the two successive price drops within the last three months of 2018, both MACD lines are historically low. That in itself is an indication that we are dealing with a market that is currently oversold. However, this does not necessarily mean that a significant recovery is about to occur. A sideways movement is certainly also a possibility. If we look at the daily charts, we notice some recovery in the last trading days of the year. As an illustration below the daily chart of the QQQ. Nevertheless – just like with the previous bounces in the downward trend – it is noticed that the volume remains substandard. So we certainly can’t talk about a real recovery yet. For the time being, I will wait and see, patience is a skill that can save an investor a lot of money, which is something I experienced myself in 2018. The current timeframe for taking new short positions has become a bit too uncertain given the severe decline we have already experienced in a relatively short period of time. At the same time it is still far too early to take up new long positions. 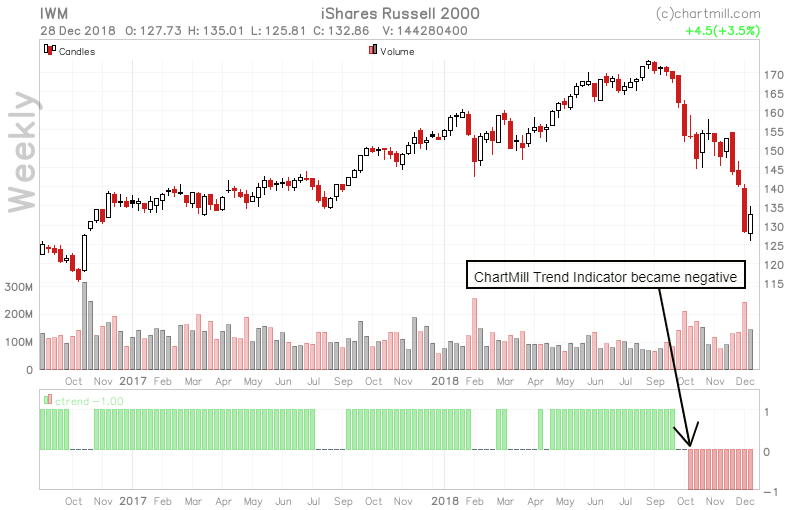 The trend is undoubtedly negative in the long run, which is nicely illustrated when we plot our ChartMill Trend Indicator. 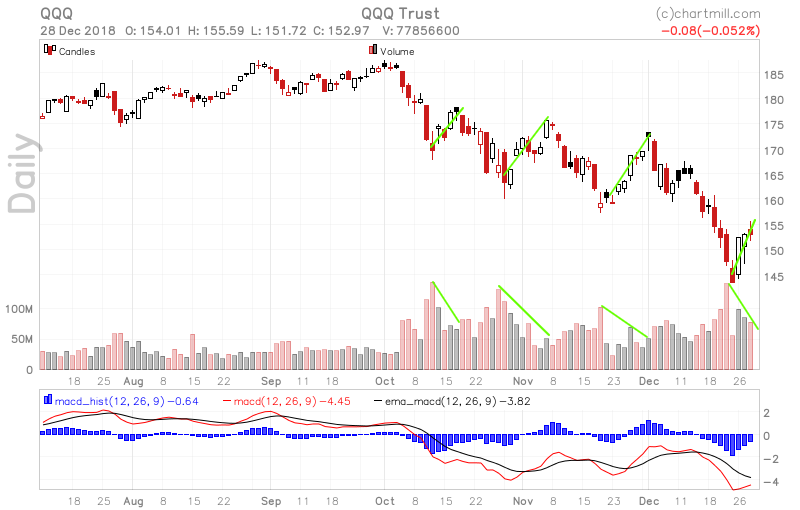 As an example i plotted the indicator below the IWM-etf chart. Below are some predefined screens that I use regurarly to look for longsetups. I run those screens about once a week. Once the long-term market trend is again neutral or positive, I determine which candidates will be used for real tradesetups based on this first automatic selection. We’ll definitely keep you informed as soon as circumstances improve to such an extent that we’re looking at new tradesetups. The chartmill crew wishes you a fantastic and successful 2019, both on a personal and a business level!